Jocelyn Chng's voice softens considerably when she describes her poverty-stricken childhood in 1970s Singapore. Her parents had lost their jobs when the food factory they both worked in shut down, so they started to try to scrape a living making sauces in their back garden, which they would sell to roadside food hawkers. With money tight, and Jocelyn's mother and father having to dedicate all their time to the business, they couldn't look after her. So she was sent to live with her grandmother in a small village until she was 11. Jocelyn, today the boss of one of Singapore's largest food companies, says: "My mum outsourced me… I saw my mum in those 11 years, but I thought my grandmother was my mother. It was very difficult when I first moved back." While Jocelyn studied hard at school, her parents quickly proved that they had a gift for business. Their company - Sin Hwa Dee - grew swiftly, and by the mid-1970s it had its own factory. 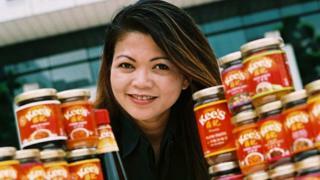 Selling to shops across Singapore, its bottled sauces and rice mixes were becoming household names. As a teenager Jocelyn balanced schoolwork with helping out at the business, before going to the National University of Singapore to study economics. She didn't have any plans to join the family firm full-time, but while she was in her second year, aged 21, her father died following a long illness. As Jocelyn was the oldest of six children, she was told that she would have to take over the leadership of Sin Hwa Dee, which was by then faltering due to her dad having been unwell for a number of years. She soon steadied the ship, and since then has successfully expanded the company into other areas, such as event catering, chilled ready meals, and hot food vending machines. Today a multi-million dollar business, Jocelyn has also led an export drive across Asia, which is now seeing Sin Hwa Dee expand into China. It has not all been plain sailing though, as Jocelyn had to endure the sudden death of her husband Richard in 2004. Upon taking up the reins at Sin Hwa Dee Jocelyn faced a steep learning curve, quickly tasking herself with studying how she could improve and grow things. Assistance came from her brothers and sisters, who one by one joined her at the company. "We looked at branding, packaging and production, research and development, the market channels, growing exports, and other areas," she says. "We were all so young then, but we started to grow the business." Occasionally there were financial losses, but Jocelyn says she learned from them. "They have been valuable lessons, and I don't think of it as failing," she says. "I always want to know what happened, and work out how I can do it better next time." A key year for the business was in 2001, when Jocelyn's husband Richard Wong - whom she had met at university and married in 1993 - also came on board. One of his biggest contributions to Sin Hwa Dee was the idea to launch a company called JR Foods to make meals for hotels, restaurants and other businesses. "My husband had a vision," says Jocelyn. "He could tell costs for restaurants and hotels were getting higher and higher. "So he started to look at manufacturing food for hotels, caterers, fast-food chains and airline caterers. "His aim was to reduce the manpower required for these types of businesses, and to help them increase their productivity." However, some three years after starting JR Foods, Richard was diagnosed with cancer. "Within two weeks he was gone," says Jocelyn. "It was really a very tough time for me. I had been with Richard for half my adult life. "My youngest was just one year old. So I had to learn to become a mother and a father to my [three] boys. And I was still running the business." Jocelyn puts much of the continuing success of Sin Hwa Dee down to Richard's vision. It was also his idea to start serving hot meals from vending machines. The company now has more than 100 vending machines dotted around Singapore, offering everything from chicken curry to pasta carbonara. "The machines are in all the major hospitals, in schools, universities, some shopping malls, hotels and army camps," says Jocelyn. "From an iPhone I can tell how much we've sold, how much is left, and when we need to restock. It's a smart solution." Meanwhile, clients of the event catering side of the business include the Singapore Grand Prix. Although the main part of the business is still 100% family owned, the JR Foods part of the business (now called JR Group) has seen some outside investment. "We needed to keep growing JR Group, and we needed the capital to do that," says Jocelyn. "And of course if any of the right partners were to come along, we would be keen to look at a merger. But they would need to have my passion for this company." As the business continues to grow, Jocelyn says she thinks her late grandmother and husband would be proud of her.